This is a quick and tasty berry cake roll recipe that is perfect for summer when berries are in season.Making a berry cake roll that is easy to make,refreshing,and beautiful is simply delightful.It’s tastes really light that you might be tempted to get seconds. Line a 10×15 jelly roll pan (large baking sheet) with parchment paper going over the sides of baking sheet.Spray with cooking spray. In a stand/hand mixer bowl, beat eggs on medium speed while slowly adding sugar.Increase speed to high and beat until eggs are pale and fluffy. Spread the batter evenly on prepared pan. Bake for about 10-12 minutes or until cake is golden. Roll the cake up loosely while hot and let cool completely. Beat cream cheese until smooth.Add in powdered sugar and continue to beat until sugar is well combined.Add vanilla or liqueur. On medium speed gradually pour in heavy whipping cream while slowly increasing the speed as it begins to thicken. Continue to beat on high until cream is fluffy. Carefully remove parchment paper while unrolling the roll. 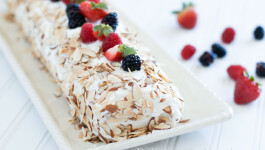 Spread cream over the roll and scatter your choice of berries over the cream. Roll the cake and cover with cream. 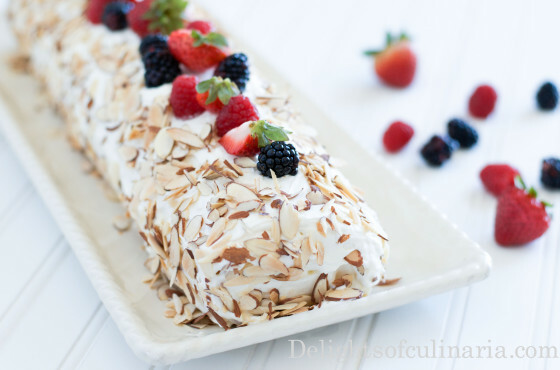 Top with shredded almonds and decorate with berries and mint.Refrigerate for at least 1 hour. Line a 10x15 jelly roll pan (large baking sheet) with parchment paper going over the sides of baking sheet.Spray with cooking spray. 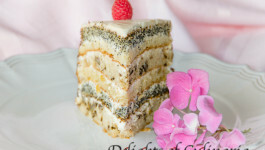 Cake Damskiy Kapriz is a multi layered Russian cake that is very delicious and moist.Three different layers consist of walnuts,dried apricots and poppy seeds.Each layer is sliced and soaked with moscato wine syrup and covered in smooth sour cream frosting or dulce de leche frosting. 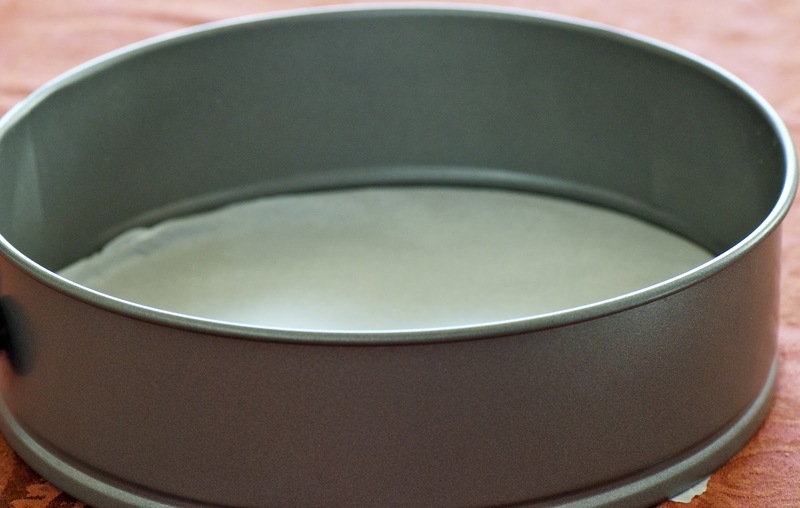 Line and grease three 9-inch round spring-foam cake pans with parchment paper. Using a stand or hand mixer,beat eggs with sugar until fluffy and light in color. In a small bowl combine baking soda and vinegar. Add sour cream,vanilla,baking powder and baking soda vinegar mixture to the beaten eggs. Gradually add flour and corn/potato starch and mix carefully until the batter is smooth. 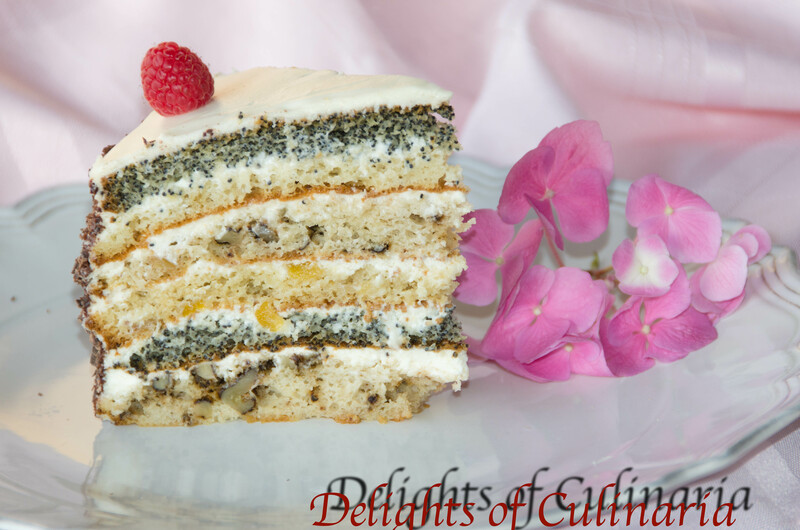 Divide the batter into three portions and add poppy seeds to one portion,walnuts to other, and apricots or raisins to the last one.Mix and pour the batter in the cake pans. Bake 2 of the cakes at once for about 15-20 minutes. Bake the third cake after the other two. 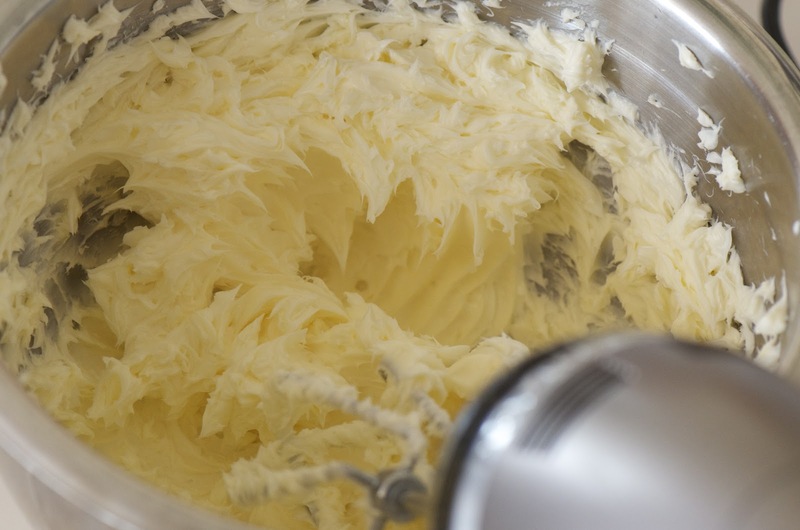 Beat butter with sugar until light and fluffy using a stand or hand mixer. add in condensed milk,vanilla and sour cream. Beat on high until all ingredients are well combined and cream is smooth. Slice each layer in half. Spray or pour syrup around the layer first layer. 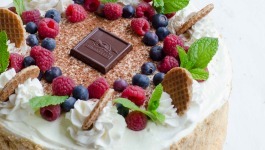 Spread cream on top of the cake layer. Repeat steps for all the layers. I used shredded and melted chocolate. 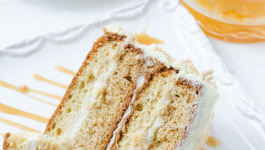 You can also use dulce de leche cream for this cake. 2 sticks butter softened at room temp. Beat butter with cream cheese. Add dulce de leche and beat until smooth and creamy. 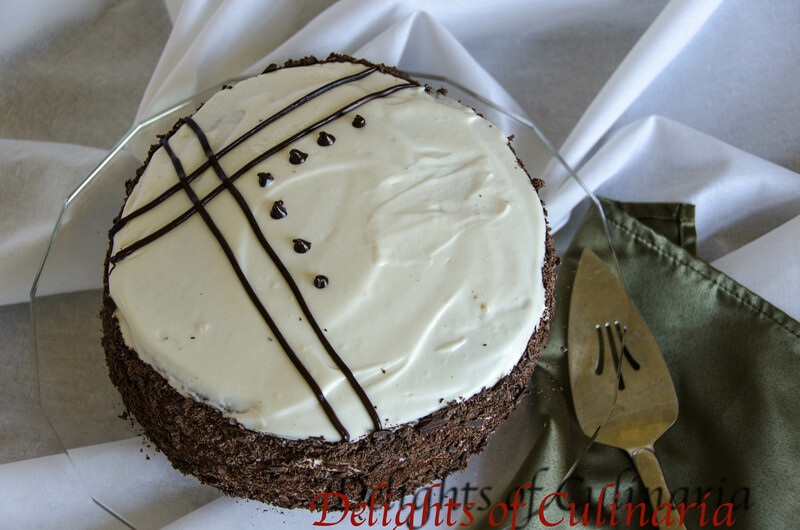 This Russian turtle cake is really moist with nice little crunch,chocolate, and citrus flavor. To make it even more special for your kids birthday you can arrange the cake pieces in a shape of a turtle.Use raisins or chocolate chips for the eyes, and chocolate syrup or ganache to outline the shell. 1/2 cup raisins soaked and drained. Shredded chocolate or cocoa for dusting. Line a baking sheet(s) with parchment paper. Mix vinegar with baking soda and add it to eggs and sugar. Add cocoa and beat again. 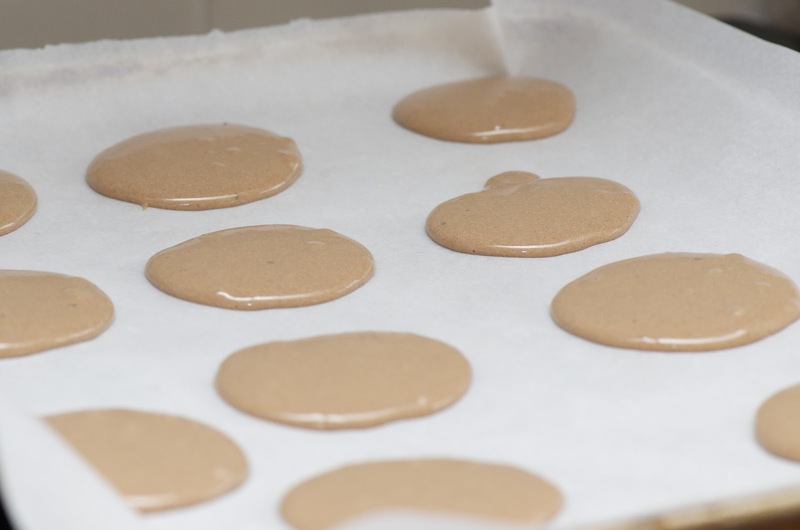 Using a teaspoon, Add the batter on the baking sheet. Bake for about 12-15 minutes. don’t over bake. You will need like 2-3 baking sheets. Add butter,zest,walnuts,cocoa and raisins to sour cream. Mix to combine all the ingredients. 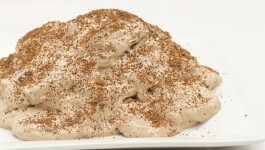 Dip cooled cake pieces in the cream and arrange one on top of another forming a little hill or turtles back. Sprinkle with shredded chocolate or cocoa. Refrigerate for at least 6 hours or overnight for better results. Using a teaspoon, Add the batter on the baking sheet. Bake for about 12-15 minutes. don't over bake. Flight cake is one of my favorite cakes since childhood. 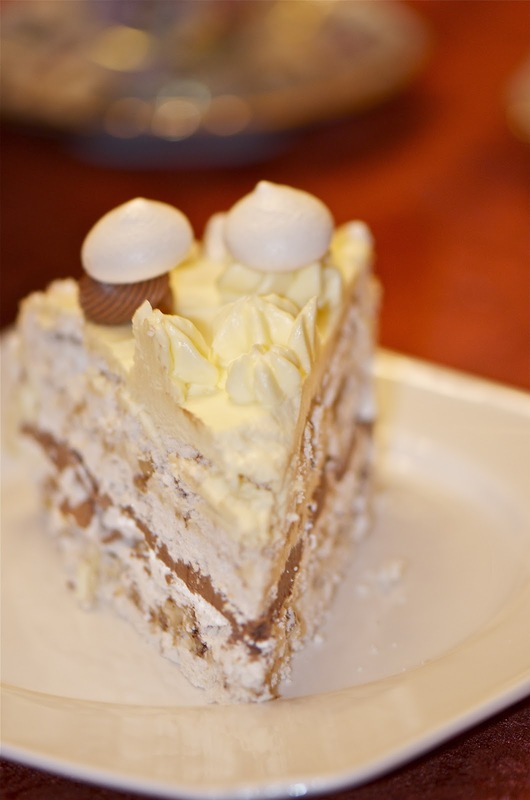 Sweet crunchy nutty meringue cake with buttery pastry cream filling.You may choose to go with nuts of your choice like roasted walnuts,hazelnuts or peanuts.Although the traditional recipe calls for peanuts. Beat egg whites with sugar ( gradually adding speed) until strong peaks form. Reserve 4 tablespoons in a separate bowl and set aside. Divide the meringue into 2 round baking pans. Bake for about 2 1/2-3 hours. Use the rest of the reserved meringue to make little droplets using a decorating bag then bake for about 45 minutes. In a saucepan,whisk egg yolks,sugar and flour until its completely smooth and pale. Gradually whisk in warm milk and cream. Place on the low heat. Cook continually stirring with a wooden spoon or a whisk until thickens and starts to boil. Transfer to a bowl and cover with plastic wrap. When the custard cools,Beat butter until light and fluffy. Take out about 6-7 tablespoons of cream in to separate bowl and add cocoa and cognac/brandy.Beat together to combine ingredients. 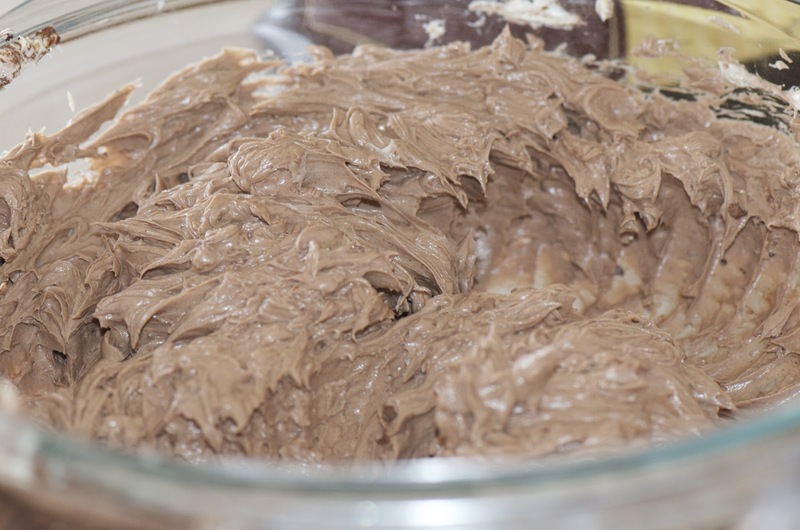 Take the first layer and spread chocolate cream. Place the second layer and add the cream to the top and sides of the cake. 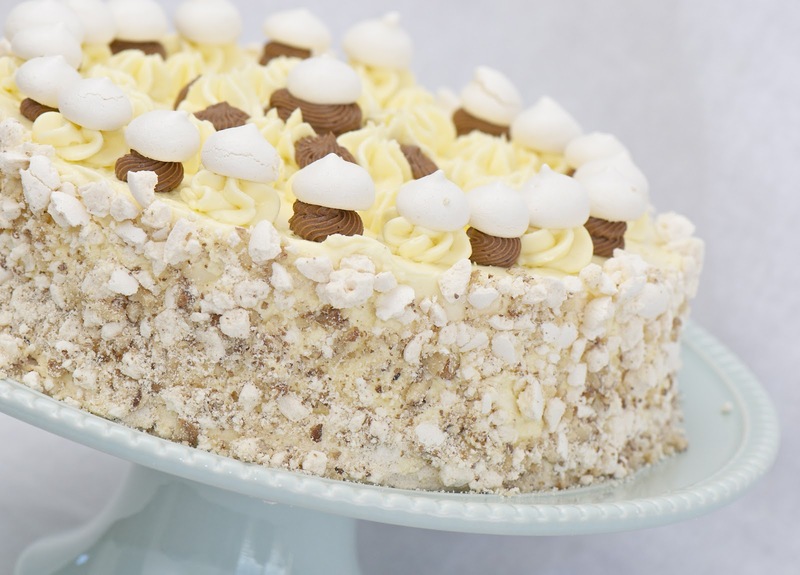 Use leftover cream and meringue droplets to decorate. 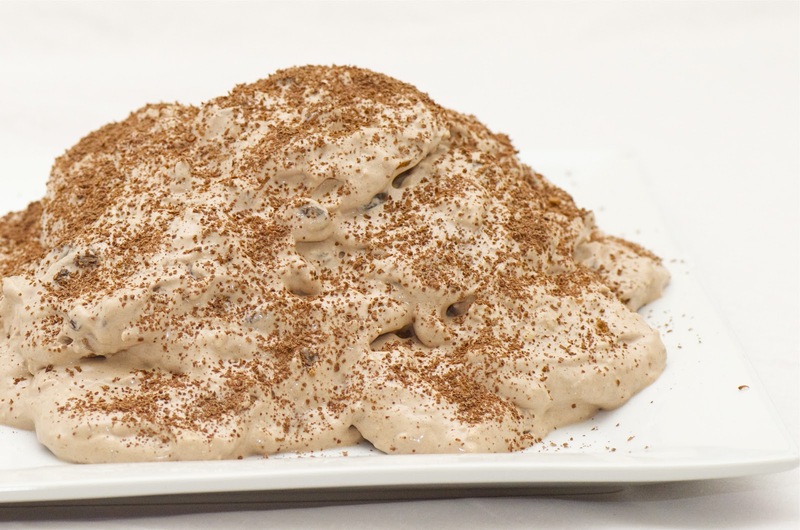 *For the sides I used crushed nuts mixed with crushed meringue pieces. 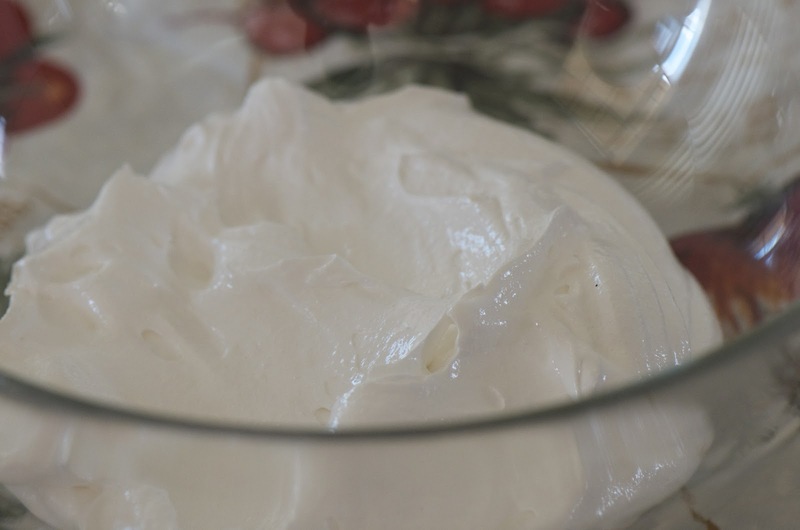 Beat butter with cream cheese until smooth.Gradually add condensed milk and beat well until combined.Add whip cream and beat again. *note: If you will use heavy whipping cream instead of whip cream topping, then beat it together with powdered sugar in separate bowl then fold it in gently to the cream. 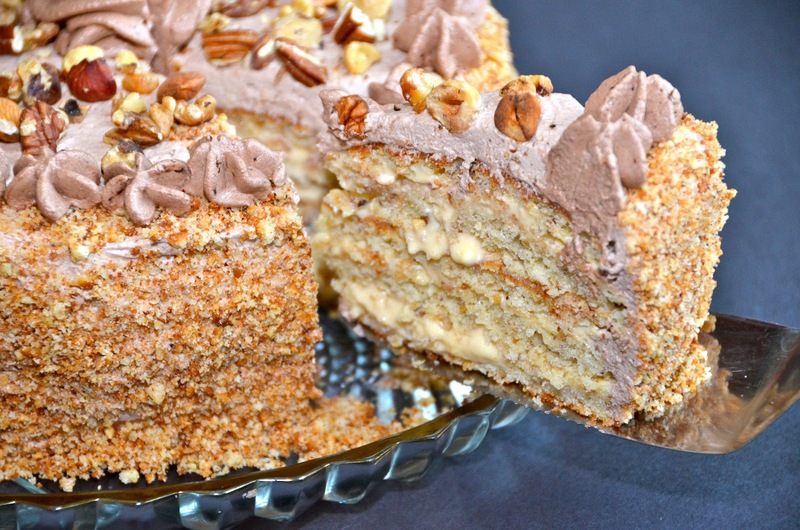 If you like nuts, then this “squirrel cake” is for you.It does take some time to make it.It is fairly sweet and fills you up quickly. In a mixing bowl or stand mixer, beat eggs on high speed until they will be foamy and pale.Add the sugar,sour cream and butter. Mix on low. Combine flour,nuts, and baking powder. 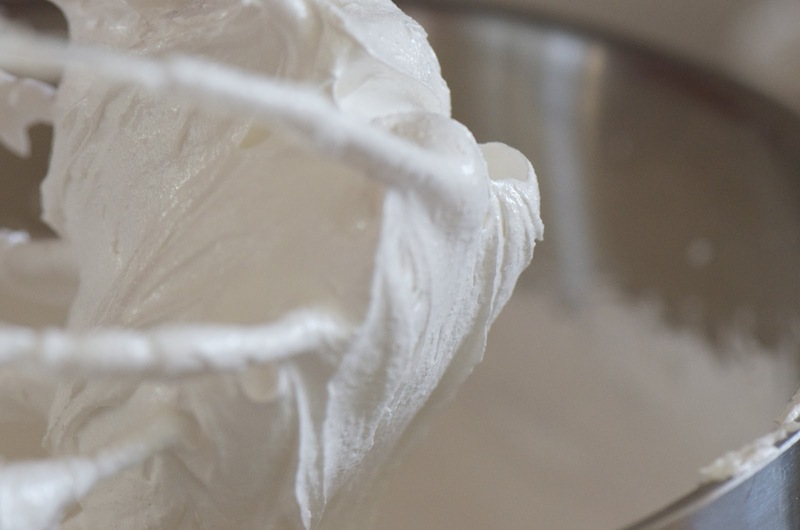 Gently combine the flour mixture with the whipped eggs. Grease a 9 x 2 3/4 spring-foam pan. Pour half of the batter to the pan and spread it with spoon or spatula. Beat together butter with dulce de leche. Add sour cream, and beat again. 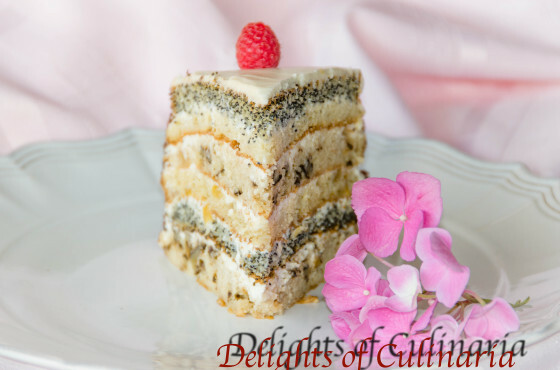 Carefully slice the cake to have four layers all together. Spray or add syrup using a spoon on each layer. 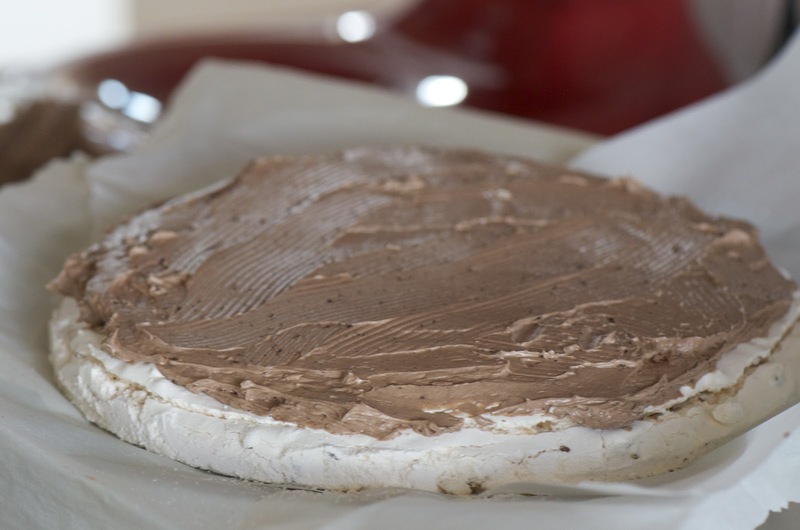 Spread the cream evenly on each layer leaving the top. Beat together heavy cream with sugar.Gradually add cocoa powder. Spread the cream all over the top and sides of the cake. 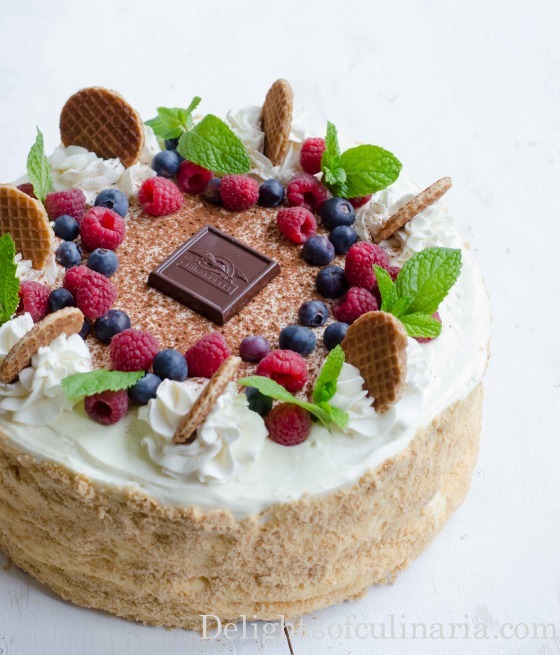 Decorate the cake as desired. Top it with mixed nuts,chocolate, sifted cocoa. 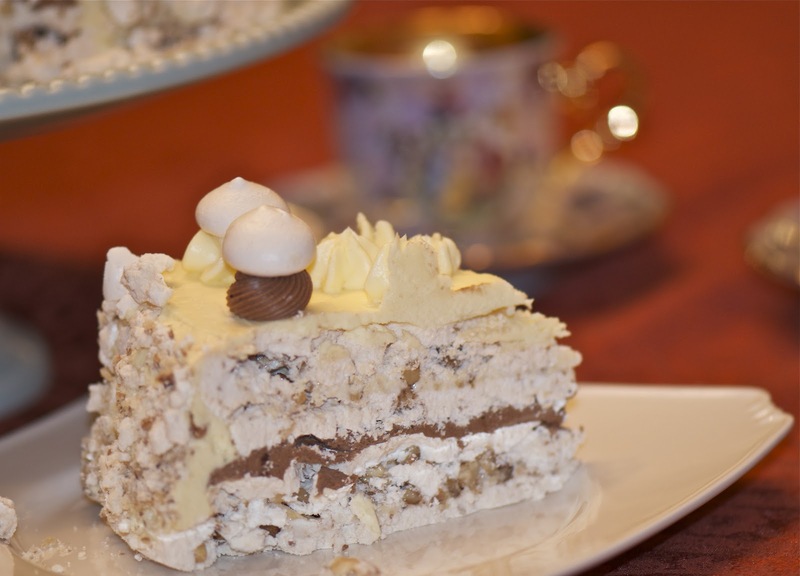 Kievskiy cake is meringue cake with nuts in between two sponge cakes slightly soaked with syrup and apricot preserve that’s covered with delicious cream!. Sounds so delightfully tasty already, but wait until you try it… It can’t be better. 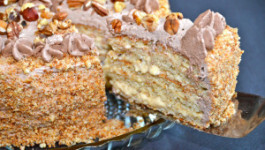 Its a very popular Russian/ Ukrainian cake that got it’s name from “Kiev” city in Ukraine in early 1950’s.There is also lots of variation on making this cake, and this recipe is the one that my family adores . (especially my mom,who is not a big fan of sweets). Meringue takes some time to bake, I like to make it day before I make the whole cake.When Apricots in season I like to make my own preserve, (apricots and sugar simmering over low heat for about 1.5 hours) but otherwise I use store bought. * You can also omit whip cream, just add 2 sticks butter and 1 more can of condensed milk. On high speed beat egg whites with sugar until really stiff about 20-25 minutes. On high speed beat eggs with sugar, when the batter is stiff and light, add flour and mix it well. Pour the batter into 9” round baking pan and bake for about 30-35 minutes. Beat butter with cream cheese until smooth. Gradually add condensed milk and beat well until combined. Add whip cream and beat again. note: If you will use heavy whipping cream instead of whip cream topping, then beat it together with powdered sugar in separate bowl then fold it in gently to the cream. spread the jam or preserve. 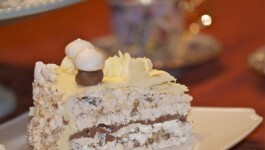 place meringue cake on top, and add another good layer of cream. 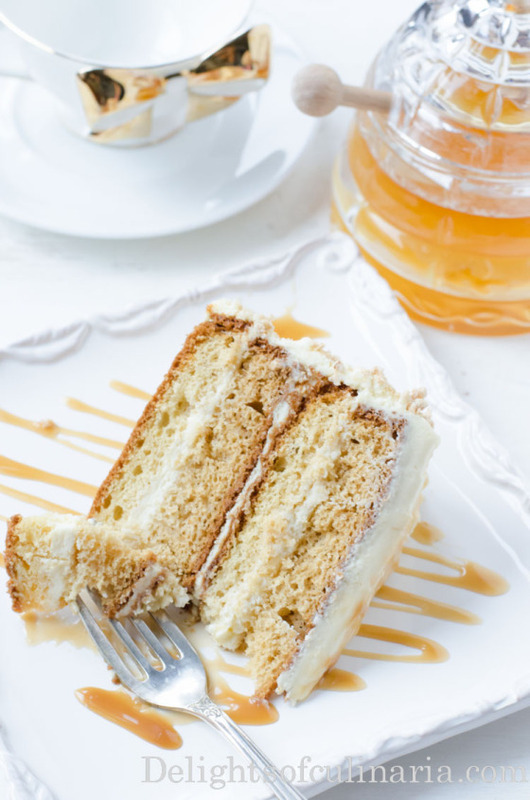 Soak the other slice of cake with syrup, and spread jam or preserve.Place it on top of the cake. Spread the remaining cream all over the cake. 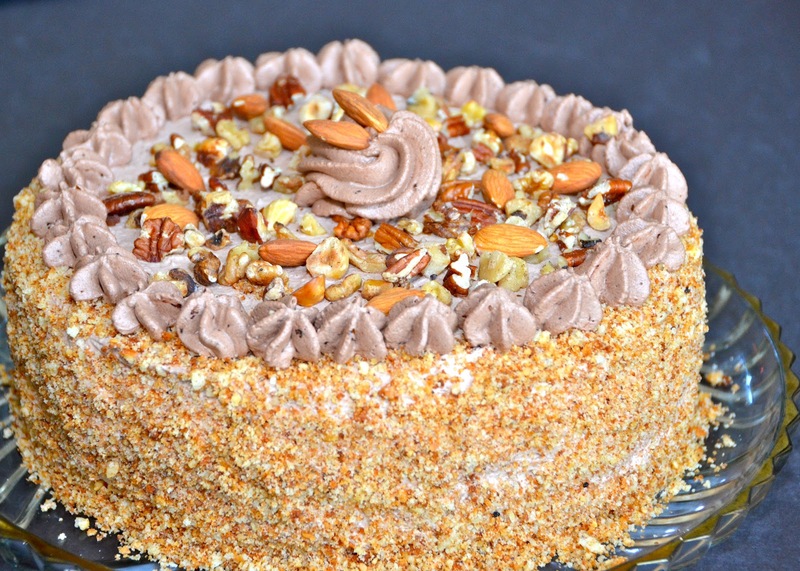 Sprinkle cookie crumbs on the top,(and sides if you like) and nuts on the sides of the cake.Or you can do how ever you like depends on your preference. Keep it in the fridge for at least two hours. Serve with a cup of hot tea.Enjoy! Pour the batter into 9'' round baking pan and bake for about 30-35 minutes.